Laura and Dave's Birthday Bash! thanks for your comments about Boston, Jake and all. We will see. Its a game time decision. If the leg muscles are fully healed then its a go. i am probably stronger(physically) than I was last year when i ran 2:33 after running the Cherry Blossom and National Marathon. In fact, before the National and Boston I felt terrible but did well. There is something about Boston that brings out the best and makes one forget about all else. The crowds, the tradition, the women at Wesley college, the homeward stroll coming onto Boylston st. and ramming it home. Nothing else like it. There is nothing like the finish. Sort of like entering the roman Colosseum with the crowds screaming and going wild. Luke, you will have a blast. At this point, its about mental confidence and believing that the hamstring issue is truly resolved. As for Cherry Blossom, i will be out there to cheer the troops. Steve Meinelt is running it as well and might be the top American. I am envious of everyone racing and killing themselves out there. Alas, i feel like the injured athlete who needs to discipline himself so as to not get injured again. I have been doing every other excercise in the world and will be ready to run when the legs are totally strong. All I can say is go with the wind and keep it up. For those that feel good, continue to stretch, get massages and do ice baths. If you have a chance, go to the LetsRun website and check out footage from the cross country championship in Kenya this past weekend. After the race, the runners were immediately dumped in buckets of ice and taken to the massage tent. These are the best runners in the world, so they know whats up. I am still contemplating the Boston Marathon. I will wait until Saturday to make the call. It seems like the PIKE'S PEEK 10K in Rockville will be the next big race where GRC will be running as a team. The race will be on April 29th. I have never run it, but I hear it is super fast...a "PR course." MEN: Matias, Jason, Christiam and Jake. I am also trying to get "freshman" Joe Wiegner to run. I heard that DaveO is in a wheelchair (just kidding but I know racing isn't in Dave's immediate future) and Max will be in one soon. Steve Money? Luke? Scott? Ben? Kyle?...any interest? As some of you know, I'll be running my first marathon in June. I am going to begin "training" in earnest on April 2 (after Cherry Blossom)...that gives me 11 week until the race on June 16. I use the quotes because I've been running now consistently for a year, but I want to create a rough training schedule that has me slowly increasing the mileage and long runs before tapering during those 11 weeks. Any suggestions? I don't need a day by day breakdown, what I really need is a week-by-week mileage/long run total along with any key workouts/suggested races I should be doing. Here are my stipulations - I won't run any more than 90 miles/week at my peak and I don't want to run anymore than 22 miles for a long run (I think I'd like to keep it at 20). My long runs will most likely be run on Sunday (when I have time). Ran for UMBC in college...mostly a xc 8k guy (25:29), but also ran events as low as the 800 (1:56.9) and 400 (51.4). More recently, I ran 5:20 pace last October for 10 miles and in the past 4 weeks ran 32:12 (10k) and 15:21 (5k). I've been running around 60 mpw for approx 9 months (high of 76, low of 40 - sick week) with a weekly long run average of 14 miles (12-16). The week of 4/2 I plan to take it easy, but I want to gradually build up to 85-90 miles (NO MORE) at the peak of my training. I want to make a gradual increase of weekly mileage (with a rest/easy week every 4-5 weeks) for the next 11 weeks. My first week back will be around 45-50 miles (recovery from Cherry Blossom)...so I need to go from that to 85/90 and then taper. Thoughts or ideas? A good workout I should run? Should I run a half marathon "X" weeks before the big dance? Thanks. Great job everyone! I spent more time cheering than taking pictures, but here's the few I managed to get (with the aid of Dave's parents). EVERYONE WAS FANTASTIC. I WISH I RAN IT. THE WEATHER WAS IDEAL AND THE COURSE APPEARED TO BE FINE EXCEPT FOR THE BIG HILL. MARATHON CHAMPION IRON MIKE WARDIAN IS TO BE COMMENDED FOR HIS GAZILIONTH MARATHON VICTORY IN WHAT SEEMS LIKE A MONTH. YOU ALL HAVE BEEN RUNNING LOADS OF MILES AND TRAINING LIKE MAD, SO I AM NOT SURPRISED YOU DID SO WELL. TREAT YOURSELVES TO GOOD FOOD AND CARE AND TAKE IT EASY. IF YOU NEED MASSAGE OR THERAPY, LET ME KNOW. FYI---FOR THOSE NOT PART OF THE TEAM AND LOOK AT THE BLOG AND KNOW ME THIS IS FOR YOU: I SAW OTHER VETERAN RUNNERS I HAVE KNOWN FOR YEARS OUT THERE LIKE 41 YEAR OLD JOHN PIGGOT TAKING 4th, PAVEL FRELICH BRINGING IT HOME AND EVEN LOCAL RUNNING LEGEND, JAY WIND RUNNING HIS 10000th MARATHON. BACK BEFORE I WAS BORN JAY USED TO WIN ALL OF THESE LOCAL MARATHONS. CONGRATS! 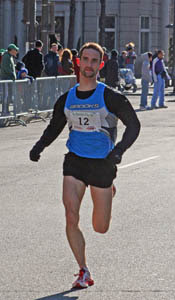 IN THE HALF MARATHON, G-TOWN RUNNING LEGEND, CHRIS(THE MYSTERY MAN) RAABE, BLAZED THE COURSE IN 1:07. IN DOING SO, HE BEAT THE MIGHTY GURMESA. TOO MANY RACES HAVE HUMBLED THAT POOR GUY. SPECIAL KUDOS TO PHILIPPE ROLLY WHO NOW HAS A BUNCH OF KIDS AND IS MARRIED AND SUCH AND YET, STILL FINDS TIME TO CRANK IT OUT. Soon thereafter, pack runs approximately 2 mins off the course! Mile 17 - Dave is a few strides behind Matias. Jason and I jump in and run with Dave from Virginia Ave to the hill on Calvert, just after mile 19. Mile 18-19 was a 5:59 for Dave. 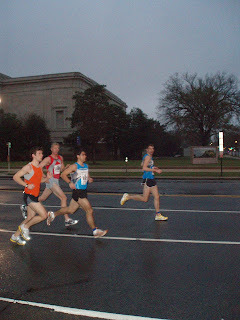 Matias had gained a 10 second lead and was running stride for stride with another runner...Dave was alone. UNOFFICIAL: Wardian is rumored to have won in 2:26, LaSalle grad Brian Skelly second, Kyle Smitts 3rd...Phillipe Rolly 5th. MATT LURKING IN THE BACKGROUND. Its Spring and you all should be flying out there. Unless you are beat up, get out and enjoy the air. its 70 degrees. Good to have you aboard Joe. Also,I spoke to Wilson and I am trying to inspire him to come out on Wednesdays and do some serious workouts as we have done in the past. If not on Wednesdays, we will have to post multiple training times with various locations to accommodate everyone. For those running the Marathon this weekend, good luck! I am jealous as i would love to be out there running like the wind. whats up. My name is Joe Wiegner. 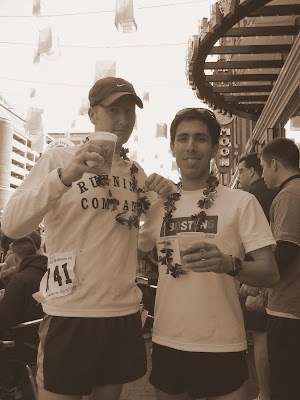 I met Jake Klim at the Shamrock 5k in Baltimore 2 weeks ago and he talked to me about the georgetown running co and sent me an email to be a part of this blog. I live in Germantown and have been running solo since I moved down to maryland from philadelphia (in the summer). I went to JMU with Ben for a year (he was a senior, i was a frosh). I talked to ben about the club a while back but with my busy schedule starting up my first year as a teacher, I didn't have too much time to run earlier this fall/winter. Ben, i apoligize for not getting back to you sooner... it has been crazy with my job and helping to plan a wedding for june. Recently I have gotten back into it and am racing again.... 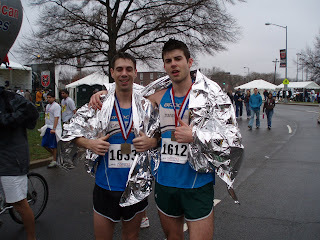 I am really looking for an organized team to race with/maybe meet up with 2 times a week or so to run/workout with. As you all know, its tough to stay motivated when your running solo. I previously ran with the Brooks Manhattan TC and after leaving philadelphia, the distance was too far to get up to the city on weekends... I really want to get involved with this team cause Ben and Jake both have told me some good things about the club. I just wanted to introduce myself and say that I look forward to meeting everyone. Hi everyone. I have never blogged before but after receiving 2 invitations to blog, I decided to give it a try. Most of you probably don't know me, but I also run for GRC. I have been out of the racing scene for quite a while. Since my last marathon in October, I have had a lot of trouble with my glutes and hamstrings. After a lot of PT and multiple doctor appointments, I have come to the conclusion that my problems resulted from overtraining. I did 9 weeks at 120 miles over the summer and my body just decided to rebel. From October through February I basically have done nothing but easy running. I just recently changed coaches and have started working out again. I am still not 100% but have made a lot of progress. I plan to run Cherry Blossom as my first race back, but I am not sure what to expect. I am excited to start racing again though. I look forward to meeting some of you soon. Good luck with your training. 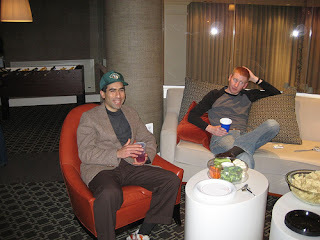 Dave O or Mighty Matias, can you drive Steve (LIVING LARGE)Money to the race on sat? He lives in dupont. if he can't get a lift he is threatening to jog to the race start. Saturday - I plan to head down and watch the National Marathon. Those on the sidelines last Sunday were very helpful so I want to pay you all back...what can I do to assist? I was going to hang out where DaveO suggested and watch/film/cheer/support the race from there. Will anyone else be joining me. Dave - what is that location again? After the race I'll run the Cherry Blossom course. I am officially taking time off of racing until Boston. No need to kill it and risk injury. i hit the bike for 1.5 hrs every day last week and lifted weights so i feel strong. i want my joints and bones fresh for Boston. I will begin running again this wed and start back slow. the fitness is there and perhaps all of the cross training will pay off for the marathon. I will also incorporate two massages a week leading up the marathon for optimal muscle work. the rest of you guys and gals, take it easy on the joints and bones. On a side note, renown massage therapist, Terrel Hale has invited all of us to his house for a post race meal after the Pikes Peek 10k. He does some work for the Montgomery County Road Runners and will be there to run the race, as well. His wife is from France and will make Crepes for us to devour. You can ask him questions and see if the massage work he does can be an asset to your running. Everyone who ran today should be happy for no other reason than you got out on a windy and cold day and ran a good one for old st. pat. Jason is a man possessed and clearly feels good and is having fun. Klim, no worries man, everyone has those days of blaaaaaaaaaaaaaaaa. I do not know what happened to Philippe. bathroom break is the rumor. Steve looked strong as did Matt and Melissa. as with all sports, some days you are person without peer and some days you are normal or flat or whatever. Its called being a part of the human life cycle so get used to it. The National Marathon should be fun too. Matias looks prepared as was indicated by his riding around on his road warrior like bike with dress shoes and a ski-mask, etc. They will call him Mighty Matias. Dave O, take it easy on the IT band and think positive. all should be well. For all those running next weekend in the Marathon, First off, good luck. Seconly, thought this may offer some inspiration...wishing it was just that easy. I am still planning a run this sat morning. at this point i am flexible as to where to meet. somewhere in DC. i like to run in the rain, so the weather is a mute point. give me a call at 202-215-0744 if interested. On a side note, BC will upset G-town in the ballgame on sat. I am a G-town fan but a Boston native and roots takes precedence. Go Eagles! The cocky, arrogant thing is only an act. I will try to do the same for you guys at National Marathon; small clips, some interviews etc...could be good. Jake indicated he has shin splints. others might have ailments that they think are minor. don't run a race if you are in pain due to injury. not worth it. life is long. don't let the ego rule you. one race is not worth two months on the bench. Those running the 8k might want to work together. Jake, Jason, Philippe and Steve, not sure what your goals are? I assume Jake and Jason are planning 25:20ish and maybe Philippe, too. Steve might be high 26 or low 27. For all of you, I suggest shooting for negative splits to finish strong and if anything, catch and pass others. maybe run, just below full throttle for 4 miles and then at the last mile, throw everything you have into it. I know Jason and Jake train together so maybe you two can hang on the heels of Bert Rodriguez and allow him to pull you along or vice versa. You probably do not want him to get too far away though, as he has a great kick. Melissa, there are few top flight Ethiopians running it on the women's side as is Alisa Harvey. At 41 or so, she is several age groups removed from her prime and you should be in the running for 1st place. Matt Ernst, not sure what your goal is time wise? Per Daylight Savings Time, I started running in the evenings (7pm). I've always run in the afternoons whenever I can and whenever daylight allows me to because it gives me the chance to drive somewhere (Old Anglers Inn, the Canal, RCP) and get off the commuter-heavy streets, but it really takes a good chunk out of your evening. Last night I was making and eating dinner at 9:30 whereas a few weeks ago I would have been relaxing watching American Idol...I mean 24. Running in the morning seems much more efficient with getting it out of the way, but the runs just don't feel as good (both physically and mentally). I was wondering when others on the list run and why? Mornings or Evenings? Also, what is your work schedule like? The RunningWater 5k on April 14th is being put on by the members of Hunt Vallye Church's 20s/30s group called twelve and Adventures for the Cure . We are working to build drinking wells for underprivileged communities in Africa. All the proceeds for this race go directly to Blood:Water Mission! We are going to make a difference by attempting to raise at least $3,000.00, the average cost of a new drinking well in Africa. All registrants will receive a free T-Shirt, post-race snacks, and the good feeling that comes from helping others by donating to a noble cause! There is a limit of 250 people allowed to register for this race so please don't delay in signing up!!! I may or may not be running the 8k this sunday. if not, i will take photos of folks. if i am, someone who is not running it should. If i do it i will need to borrow a digital camera. Whoever has one give me a shout. for those who can be additional photographers, let me know. also, we need crowd support. Those who are not running it and can make it, come on down and give us good cheer. i will have singlets on sat morning at the run and at 8:15 am at the race. we can meet at the tent/table where you pick up timing chips. I started running in the evenings yesterday. If anyone is interested in joining, I plan to run at RCP at the usual spot on Wednesday around 6:45/7:00pm. If you plan to show up let me know. Jason - my emails to your Stone Ridge acct are bouncing back. Is the hill from Rock Creek up to Calvert better or worse than the hill up 18th Street at mile 19? http://www.momentumsports.co.uk/TtStretching.asp check out this site for insight on stretching, massage and other training techniques to keep you on the roads, injury free. PS. take this stuff seriously. I am all for Rock Creek and the Canal but alas, i am also for mixing things up a bit as these spots are getting all too familiar. Here is a suggestion. leave it or take it. meet in adams morgan at 8:30am and i can take you on my urban/rock creek run. the run starts at the fleet feet running store. 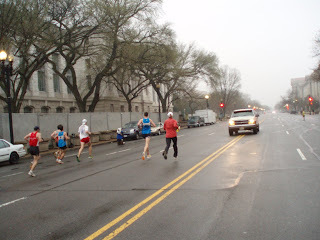 we leave from there and head to Calvert street bridge where we plop down into the park and run along the parkway out towards the Lincoln memorial. when we are near the memorial we take a right onto the canal for a brief stint and then take a left across key bridge to the mt Vernon trail. we vere to the left and head over to the memorial bridge where we cross and run along the reflecting pool(in front of the Lincoln memorial) from here, we take a left on 17th st. and run past the office of management and budget and the old executive office building. we hit Connecticut ave and then run north, right up back into adams morgan. Melissa really looks like she is rounding into peak form for the marathon. Soon she should be the best female runner in the area. I will collect a bunch of singlets and bring them to the sat run next week and the race on sunday. On one of my many side notes, this morning was the first time in my DC life, I believe, that I ever took the time to walk along the canal and stop to take notice of what an extraordinary ecosystem it is. With the early morning sun hitting the water and the crowds of runners and bikers, still not out it was nice just to walk along it and appreciate its presence and pay it some respect. I am glad it is part of the National Park System, as we all should be. Nice work you two- PRs! Way to bring home the hardware Jake! losers buy the winner dinner? Stretch and stetch and stay lose or you will end up like me and be on the bench at 70%. A Classic...I haven't seen this since 2001. God Bless YouTube! While Jake and Co are running in Baltimore, I am doing a run on the canal with former DC running champion, Philippe Rolly and another great runner, Paul Rades. Back when most of you were in diapers, Philippe was winning races and beating the world. Time has passed and he is now old, like me. However, he still runs hard and wants to run 2:30 at the National Marathon. He might be doing a killer tempo on Sunday on tha canal at 7:45am. I will try and run with him for as long as i can. we will meet at the store and go from there. anyone who wants to come and try to hang, do their own thing, etc, can come. I spoke to Wilson about the LA marathon and he said it was real tough. The hills along with the heat were devastating. He hit the half in 66 minutes and was hurting after mile 16 or 17. From mile 20 it was the Wilson gut fest. He said the next couple of days after the marathon were real hard and he had difficulty walking. Bottom line is that the marathon is no joke and regardless of what you ran a half marathon in, the full on marathon is another story and can humble and the best of runners. 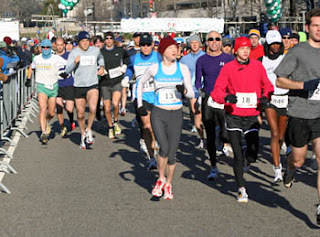 Be wise and smart if you are training for your first marathon. Go out slow! no need to spend the last three miles walking. I don't think Max is around this Saturday and I think the plan is to meet at the MD/DC line at 9am for a 12 miler or so...unless anyone suggests otherwise. I plan to take it easy and may only run 10. Let me know if you plan to show up. 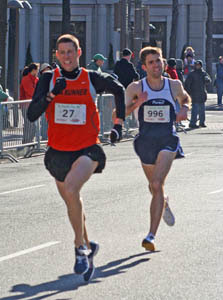 To those running Shamrock in Baltimore on Sunday - I plan on running a lengthy cool down before I hit the post-race beer tent. Let me know if a longer cooldown is in order for you. 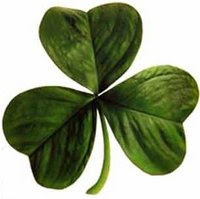 1) For those who are running on our team for the st. patricks day 8K please fax your registration in to the capital running company. put your personal info and the a giant MAX LOCKWOOD next to it so they know we are all together. As of tonight, they say they have none from you guys. 2) Dave O, can you ask Laura if she will come running with us on Saturday and she can run with Melissa and Dawn and the women can build up their own training regimine. 4)Wilson Komen was three minutes off of winning 120K at LA. The heat was supposedly terrible. Congrats to Wilson for running so well. 5) I suggest we have a runners on the way up recognition in the form of a prize or such. For example, Jake and Jason and Matias are coming on strong and running their butts off. A night out with unlimited beer a case of ENDUROX mix or something is in order. Lets put some thought into this. Ok I basically have the classic version of ITB syndrome. It starts off as a dull pain and then 15 minutes into the run it becomes a sharp pain and I can only go another 15 minutes or so. So I've been icing and stretching the last few days and will have a massage on Wednesday. This is a minor setback at the beginning of my training, so it isn't like I am going to lose a ton. But I'm still not happy about this. 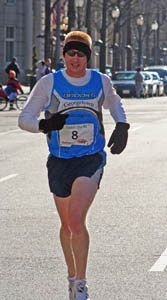 Steve Moneghetti, a four-time Olympic marathoner for Australia, developed a unique fartlek workout that is now used by ZAP Fitness, an elite running team based in North Carolina. ZAP Fitness coach Pete Rea's version of the workout alternates between short bursts of fast and slow running. o Run two sets of 90 seconds hard (five to 10 seconds per mile faster than 5-K race pace), 90 seconds easy (45 to 50 seconds per mile slower than the hard segments). o Run four sets of 60 seconds hard, 60 seconds easy. o Run four sets of 30 seconds hard, 30 seconds easy. o Run four sets of 15 seconds hard, 15 seconds easy. The workout sounds similar to Lockwood's recommendation. 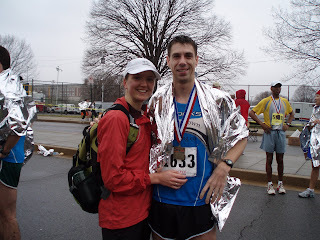 Max and I plan to meet at the DC/MD line on Sunday morning for a run at 9am. We'll be hitting trails for the first 8-10 miles before I let Max go and hammer the last few miles. I'll be running 12...Max 14 or so. Have as much fun as you can in life and you should run better and faster. And, even if you don't, kill it on the roads, it don't matter because of all of the other fun you are having in life. 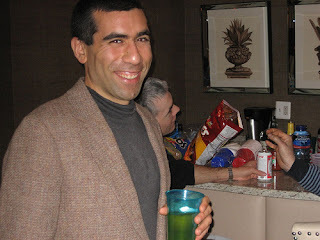 Max, the ladie's man, Lockwood (below) looks content holding a mixed drink at the Grosvenor Place Party last night, while I (above) ponder Max's attire. A new fashion statement? Matt Ernst can be seen in the background holding a Budweiser and debating politics with some local gentry. Someone sent me this link - waypoints to all the major trail mile markers in the DC-area...kinda interesting. DC RUNNING CHAMPION WILSON KOMEN TAKES ON THE LA MARATHON THIS WEEKEND. GOOD LUCK WILSON AND RUN HARD. YOU ARE AN INSPIRATION TO US ALL. After taking off a few days because I had the stomach flu, I jumped right back into running and did some speed work on the track. After the workout, my right achilles felt tender and sore and still does today accompanied with a scab on it. I am planning on immersing it in an ice cooler, but what should I do in terms of my training and rest?